A popular and durable gemstone, the stunning aquamarine rings here at Diamond Boutique are often favoured for engagement and eternity styles. Due to the gentle and calming blue of this desired stone, it suits every jewellery collection. 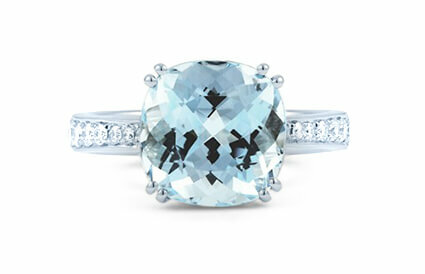 Mined in several locations worldwide, aquamarine is believed to bring health and happiness to the wearer. Shop the full range below and take pleasure in discovering the beauty and clarity of the rings offered. Looking to add a personal touch to your aquamarine ring? Many of the unique designs offer free engraving. Contact us today on +44 (0) 203 6959 885 for more information.